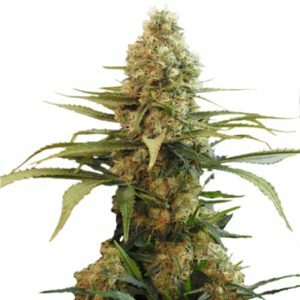 Combining two of the most powerful medical Marijuana strains, Chronic Widow has all the potent effects of the White Widow, with the additional heavy yields supplied by the best Chronic strains. An Indica dominant strain which produces a fast, hard-hitting and powerful 'body-stone'. Chronic Widow supplies it all. THC levels of 23%, a high CBD content and yields of approximately 700 grams of the finest, resinous buds per square meter. A strain of choice for both indoor and outdoor medical Marijuana seed growers. Find out more about Chronic Widow Seeds. Chronic Widow Cannabis is extremely strong, with elevated THC and CBD levels. The fruitiness of the White Widow mingles with the famous Chronic to create strong and powerful floral flavors with a sweet-honey aftertaste. Long-lasting with a happy, euphoric high and pain-relieving 'body-stone' sensation. Chronic Widow seeds can produce good, high quality yields from tall plants, due to it's inherited, Sativa genetics. A great strain for Screen-of-Green (SCROG) growing which can help to increase yields further as it divides and separates the main, central cola into many more large buds. Both Chronic and White Widow are well known for their medicinal qualities providing relief from stress, anxiety and tension, helping to reduce depression and pain as well as encouraging sleep for insomniacs. Read the complete Chronic Widow Seeds Review. Buy Chronic Widow Seeds today and receive free worldwide shipping guaranteed.